they would be writing to become government officers. 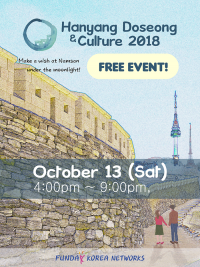 and walk along the ramparts of Hanyang Doseong to breathe in the spirit of 600 years of history. wishes under the moonlight just like the scholars had used to do in the history. 조선시대 유생들이 과거시험(지금의 공무원시험) 합격 기원을 위해 남산에 올라와 소원을 빌었던 것을 아시나요? 2018년 10월 13일, 특별한 히스토리 퍼레이드에 펀데이코리아네트웍스가 외국인 친구들을 초대하였습니다. 참가자들은 조선시대의 유생복을 입고 600년 역사의 한양도성 성벽을 따라 순성하는 기회를 가졌습니다. 조선시대의 유생들이 그랬듯이 우리의 외국인 참가자들도 도착지인 남산 산 중턱에서 달빛 아래서 소원을 빌어보는 시간을 가졌습니다.